When I came across the book Unbound Birth: How to Have a Natural Birth in the Hospital I knew it was a book I definitely wanted to read. With our other pregnancies there were certain things I didn't even know I had options about since I was giving birth in a hospital and I just went with the protocol. If you desire a more natural birthing experience but aren't ready to do it at home, then Unbound Birth would be a good read for you. It gives helpful advice and is written with an excellent tone. And by that I mean, it is not obnoxious, off the wall, extreme or in your face in any way. Jenny did a fantastic job giving her readers helpful information in a respectable manner as she shares her birth experiences and also covers topics such as natural birth, doulas (what they are and why they are helpful), how to help through the pain of labor, diet and excercise. In the United States at least, women have the option of choosing home births, birthing centers or hospital births. I'm thankful we have these options and that we have the freedom to choose which one is right for us. Personally, I prefer to have our babies in a hospital setting for several reasons but I certainly don't condemn anyone for having a home birth or choosing a birthing center. In fact, if there were a birthing center near by I might choose that. Regardless of where you choose to give birth (should you get the option of choosing--as in, you don't have to give birth in your car!!) you do have certain options that should be made available to you. Now, I don't plan on bucking the system by any means with this birth and I am extremely grateful for the awesome doctors and nurses I have had with our previous births. However, there are a few things I'd like to do differently this time around and that involves writing up a Birth Plan to have with me for this delivery. The idea behind a birth plan is to put your desires on paper for a nurse or doctor to have readily available during your labor and delivery. It's also helpful to have pertinent information such as your D.O.B., estimated due date, allergies, etc. listed so that if you are not feeling well or in pain (very likely! ), the nurses can easily access that information without having to bother you. Throughout this pregnancy as various topics regarding birth have come up, I have discussed them with my husband. These aren't decisions I want to make on my own, but they are decisions that need to be made. For example, if you're having a son, will you circumcise? Do you want your baby to have the Hepatitis B shots at birth? What about the Vitamin K shot? There are so many things that are done routinely at hospitals that it's worth your time to think through and research each option because you don't have to have everything done. After I came up with a Birth Plan rough draft, I made sure to go over it with my OB. I trust his judgment and I was able to discuss the pros and cons of various decisions but with him leaving the final decision up to my husband and me. I also love that in Unbound Birth Jenny shares her three birth stories. All of them were drug free, in a hospital, with a doula, her husband and her obstetrician. While I don't yet know the outcome of this birth I can say that that is how I hope this labor and delivery turns out for me! She also gives suggestions for recommended reading, resources on why doulas are so helpful and tips for dealing with pain during childbirth. 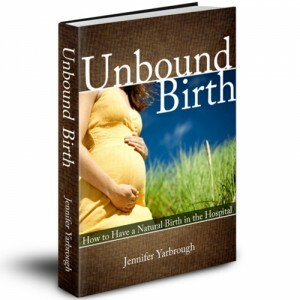 If you are preparing for birth then it'd be worth your time to check out Unbound Birth. It can be purchased here for as low as $2.99. Visit www.unboundbirth.com for more tips and articles on pregnancy and childbirth.